People in Burin have a very difficult life surrounded by the illegal settlements Yitzhar and Bracha. What I was not aware of until yesterday, when we again returned to help with the olive harvest, was that there is also an additional, small settlement outpost called Arosa on a hill very close to the village. The outpost, consisting of possibly a maximum of 20 houses, started to be built around 20 years ago and the settlers residing there regularly attack the village below. Israeli Occupation soldiers patrolling Palestinian fields with the Arosa outpost buildings in the background. It is worth noting that outposts are illegal-illegal. Yes- twice illegal. 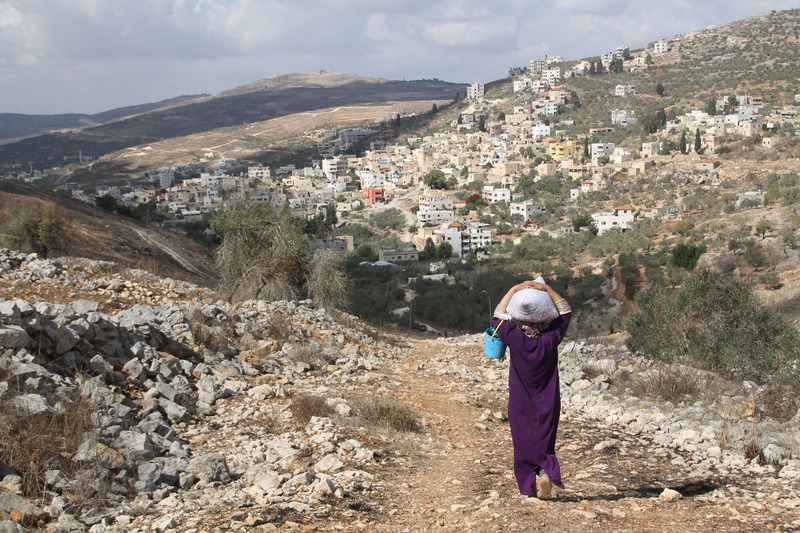 All settlements in the West Bank are illegal according to international law, but the outposts are also illegal by Israeli law. Israel should of course remove these settlers, and return the land they have stolen to the Palestinian owners, but this clearly is not forthcoming. The settlers continue to encroach on Palestinian land for example by cutting down olive trees, and building barricades on the small road up to the fields from the village in order to stop the farmers’ tractors to plough the fields. 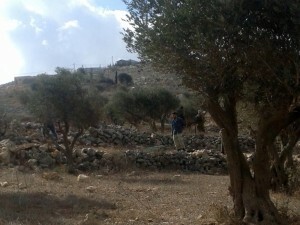 The farmers are not permitted by Israel to go to their land for most of the year, but they may get a permit for a few days during the olive harvest. This year they got 3 days. Last year, our friend Doha was not allowed to bring any internationals to help pick the olives, and was harassed by the settlers. When we arrived yesterday, to document the situation more than anything, the army met us by the fields and did not intend to allow us to assist with the work. The commander said “if they [the settlers] see white faces helping here they will be angry” – this racist comment shows how it is the settlers who call the shots and the army works for them. After some negotiation however, they agreed for us to stay for a limited time with the soldiers patrolling the fields. 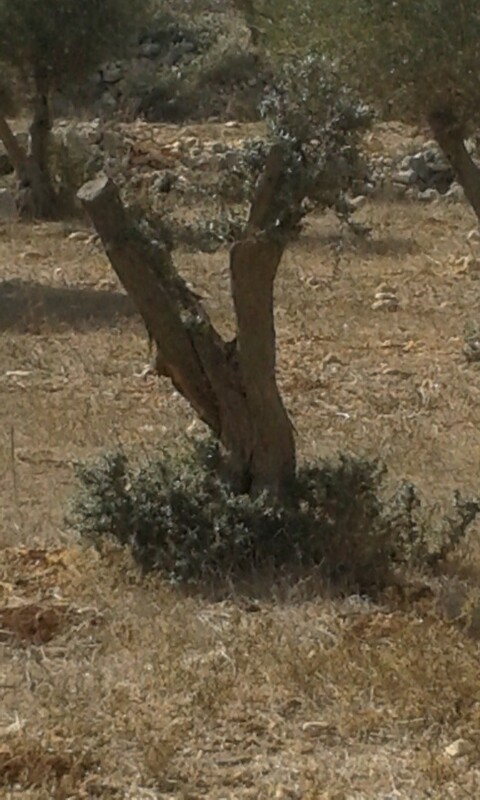 There were few olives this year, and we had gone there to prune the trees and pick the dry olives for making soap. Looking around you could see the trees that have been cut, and the outpost houses just above. Settler children came down to harass the farmers, but were stopped by the army. Hiding behind the trees we tried to take pictures and our friend was keen to get a picture of herself and her land that has been stolen. After about two hours the men who had accompanied us had finished pruning the trees and left. Our friend then suddenly got very worried about us being alone with the army and the settlers, who by now were aware that we were there. We quickly packed up our things and headed down the hill towards Burin. Her land is in a beautiful spot on the top of the hill, with grapes and olives. She deeply wishes she could go there to relax, have a picnic and just admire the view. Instead she gets three days where she has to work non-stop or leave, whilst worrying about settler violence and harassment.